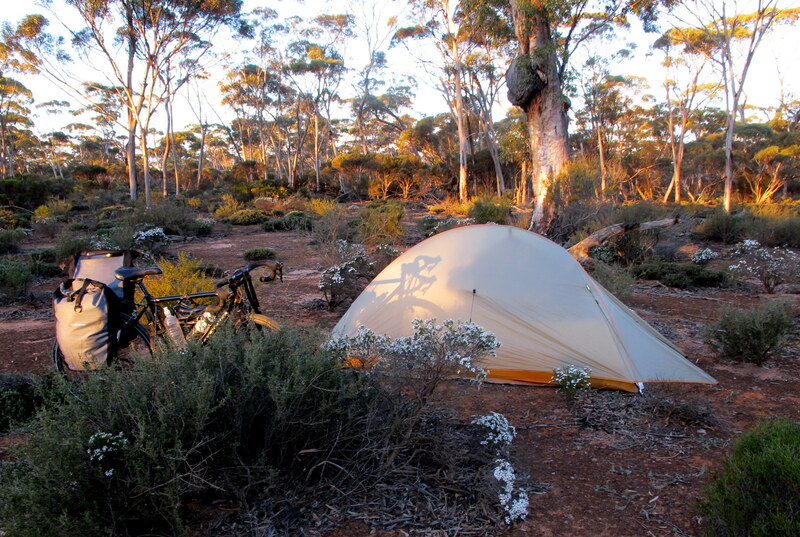 After months of planning, our Nullarbor trip became reality mid August 2013. Jan and I met up at Perth airport – arriving from Canada and Melbourne respectively – and grabbed a taxi to the home of our local Warm Showers host Jude. This was a Warm Showers first for all of us and it worked well. We had a friendly local with a sunny deck for bike assembly, great tales of touring and local cycling knowledge. Thank you Jude! What a wonderful start. Our shopping and ride to the Indian Ocean at City Beach for wheel dipping (it’s a touring thing) went smoothly so we decided to leave a day earlier than planned while the weather looked good. 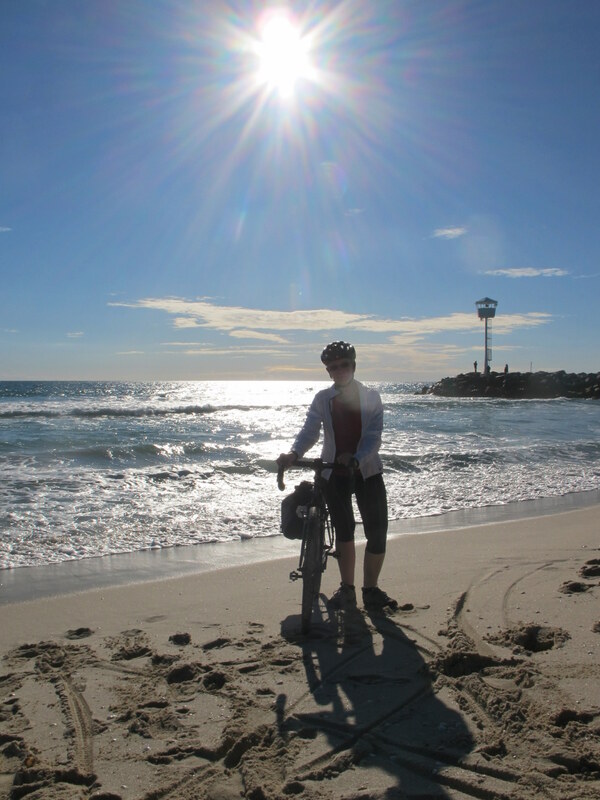 We headed out of Perth via the excellent Principal Shared Path network to the north east. The PSPs have some minor navigational challenges but it was an easy off-road route to Midland and the start of the scenic Kep Track through John Forrest National Park. 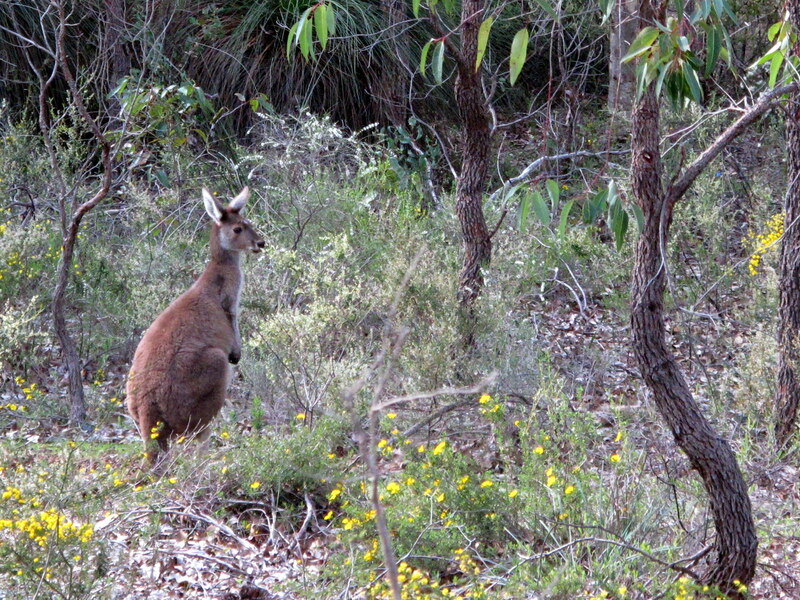 The track was in good condition and the green pickings after rain meant we spotted some roos – a bonus for Jan on day one – en route to the beautiful Lake Leschenaultia campground near Chidlow. From Chidlow we headed towards Clackline then cut through a nature reserve on the peaceful Inkpen Road. The last 30km to York via the Chidlow-York Road was less comfortable – little shoulder and 110km/h traffic but it was another 74km in the bag. The next day took us through wheatfields and canola but it was tougher than expected thanks to rolling hills and a light headwind. We called it a day at Quairading Hotel and spent a couple of hours in the front bar. Quairading to Kondinin was a solid 116 km via two stops that marked the famous Rabbit Proof Fence I’d really wanted to see. Built in three stages over six years to 1907 – hence fences No 1, No 2 (pictured below) and No 3 – it totalled 3256 km in a vain attempt to curb the bunny invasion. 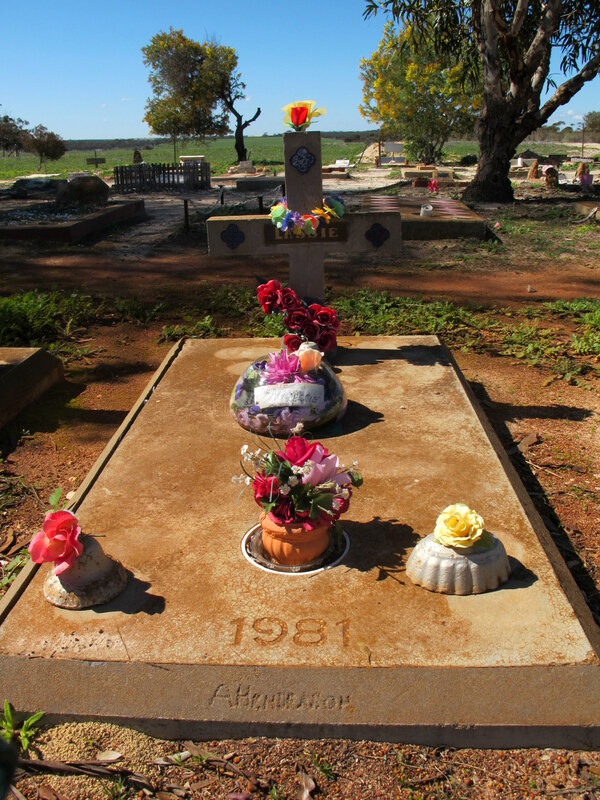 Next came the dog cemetery of Corrigin where fresh flowers adorn dozens of canine graves. Sad and encouraging all at once. We rolled in to the Kondinin council caravan park late afternoon and found a tiny oasis of grass among the caravans. The park has been upgraded with ‘Royalties for Regions’ funds siphoned from state mining and petroleum projects. We paid the $15 fee at the servo across the road and pitched our tents, adjourning to the camp kitchen for dinner. Returning after dark, we found we’d made a rookie error, pitching our tents under spotlights. Maybe they’d turn off later? So we walked to the Kondinin pub for a drink and back again. Nope, they’re all-night lights. We didn’t get much sleep but our grey nomad neighbours Don and Jan were friendly and offered to shout us a cup of tea if they saw us on the road. I was surprised we were nearly at Wave Rock already. It was a slow run out of Kondinin next morning past grain handling facilities and the word of the day was ‘undulating’. Spirits improved with a rest, shade, iced coffee milk and excellent chicken sandwich at Wave Rock Bush Bakehouse in the tiny town of Hyden. We topped up supplies in Hyden and called the police to let them know our plans. From Wave Rock we were taking the unsealed Hyden-Norseman Road 300 km to Norseman. This would be the most remote stretch of our trip with maximum water load. We’d also set up a simple check-in system with my friend Heather, so I let her know we were heading into the twilight zone without phone reception for three days. 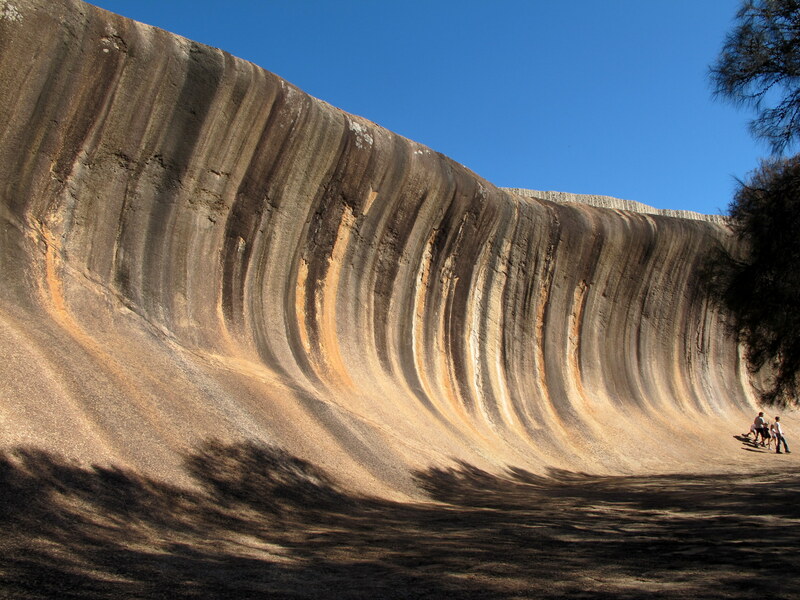 But first stop was Wave Rock, 4 km from Hyden. It lived up to expectations as a weathered granite inselberg although I left feeling uncomfortable about clambering over it. With a deep breath we rolled off, hoping to bag 40-odd km before camp. Carrying three days’ water, my bike had never been heavier and I was relieved it moved. But it’s true – you roll a bike rather than lift it – and the extra weight was no problem. While stopped along the way – and we stop often for photos and snacks – a car rolled alongside and local farmers Pat and Tim suggested we stay the night at their place. Awesome! We’d be happy with a patch of grass, but when we arrived they offered a donga normally used by visiting family or prospecting geologists. Pat also asked if we’d like tea and before I could explain, Jan accepted, thinking a cup of tea would be lovely. Actually, Pat was offering dinner in Australian, lol. So we joined Pat, Tim and son Erin for dinner, then breakfast of eggs, bacon and Nutella on toast. This is roughing it. We enjoyed their stories of arriving from Ireland, farming here and local knowledge of the road ahead – a farm experience hard to beat. After signing their visitor book in the morning we bid them a happy farewell. 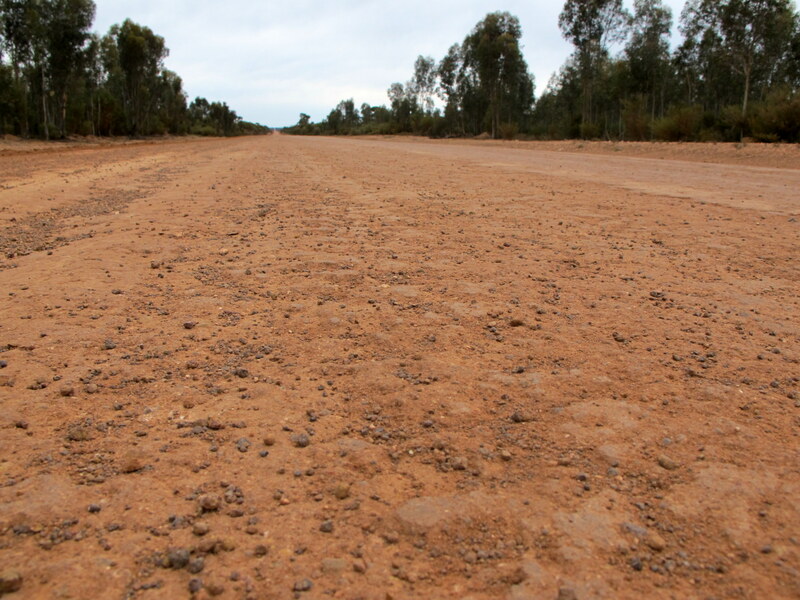 The road turned to dirt in 5 km and the bitumen returned 250 km later near Norseman. It was variously bumpy, fast clay or slow with loose topping mounded by dual axle roadtrains. But all up, it was a great unsealed road with maybe a dozen cars and road trains all day. These were the biggest road trains we encountered on the trip but they all gave us space, and usually a grin and a wave. 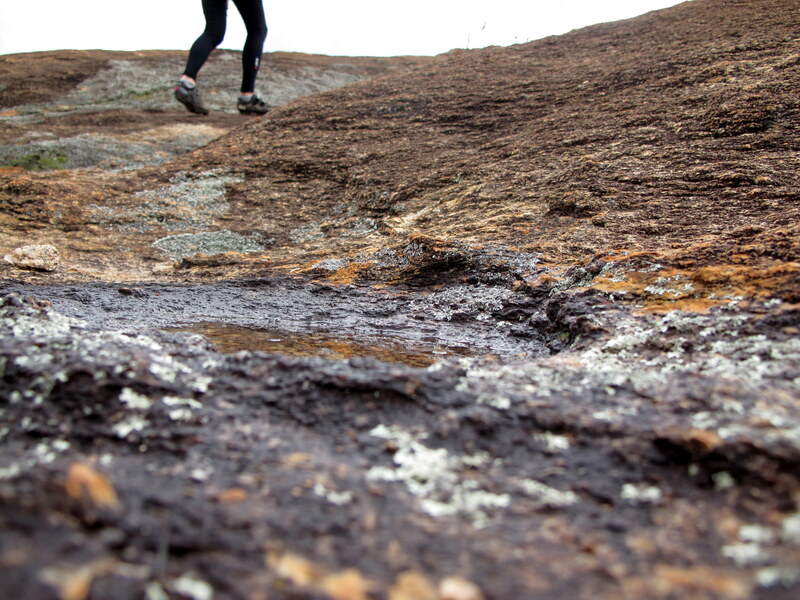 A feature along the road is the Granite and Woodlands Discovery Trail – 16 stops that explain the landforms and ecology so it’s a shame that few people get to see it. Western Australia does this sort of thing really well. We passed the Holland Track and No 1 Rabbit Proof Fence (renamed the State Barrier Fence), walked around McDermid Rock and checked out the salt pans of Lake Johnston. This was a stunning ride, reminiscent of the Dempster Highway in Canada. Our bush camps along Hyden-Norseman Road were also among the prettiest of the trip and we started to establish a routine of keeping an eye out for a campsite late afternoon, and rolling off when we found a good spot. I loved this part of the trip and was almost sorry to reach Norseman. We reported to Police there, collected a food parcel I’d sent to the post office, checked in with Heather so she wouldn’t launch a search party and booked bus tickets to Kalgoorlie. And after a few days of bush camps, headed for the showers. 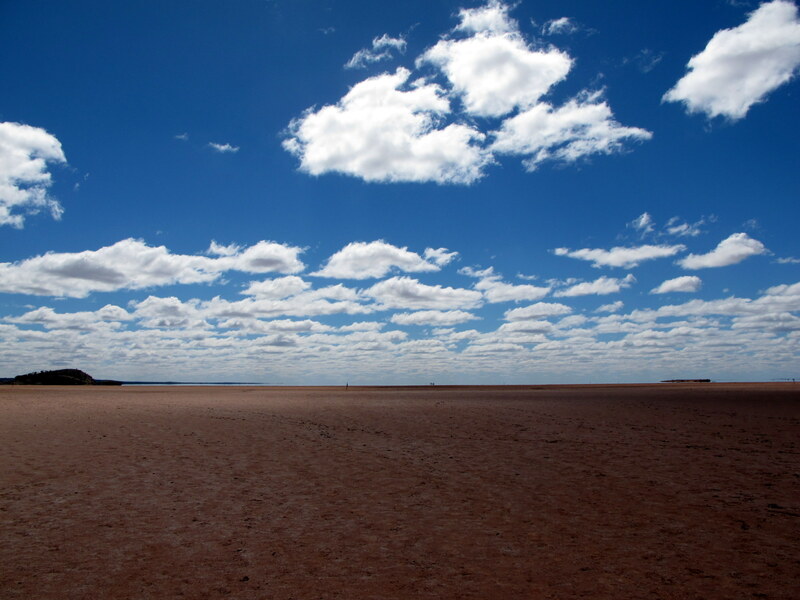 The primary goal in Kalgoorlie was a trip to Lake Ballard but we discovered on arrival that the car rental chains won’t allow their regular utes on a gravel road. Fortunately local independent Jeff from Racey Rentals could drop off a ute for us at the Palace Hotel next morning. I’ve been fascinated by Antony Gormley’s work at Lake Ballard for a while – 51 metal sculptures modelled on local residents, installed on remote sump-land 180 km north of Kalgoorlie. Makes perfect sense hey? 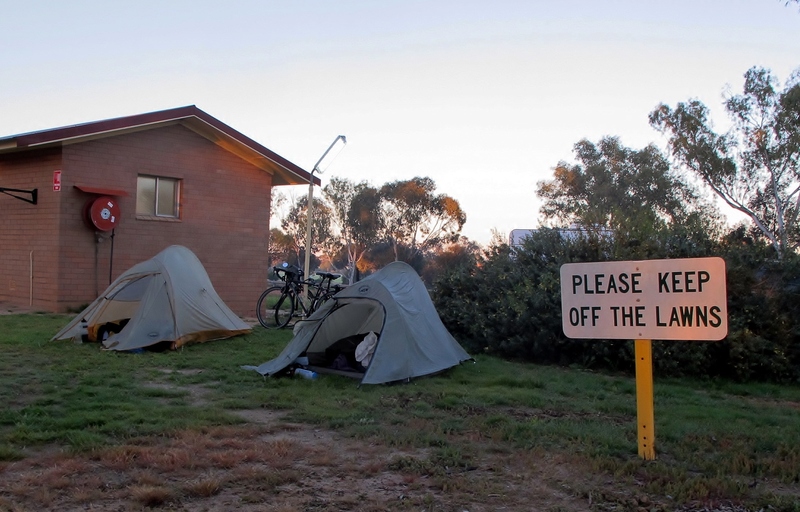 So we strapped the bikes into the ute and headed north on the bitumen to the tiny town of Menzies, then another 50 km on gravel to Lake Ballard. There’s a sign, a drop toilet and a concrete picnic table. That’s it. We walked to the lake bed and decided it was rideable so unhitched the bikes and headed off. We saw three or four people near shore but no-one near the outer figures (where it became too sticky to ride). It was better than I imagined. Large chunks of horizon turn to mirage and just when you think you’ve seen the most remote figures, another appears as a speck through the haze. Or is it? Farther out, there’s another. And another. The whole thing is surreal and it made me laugh. It’s well worth the trip even if it means a bus, a ute and two bikes. 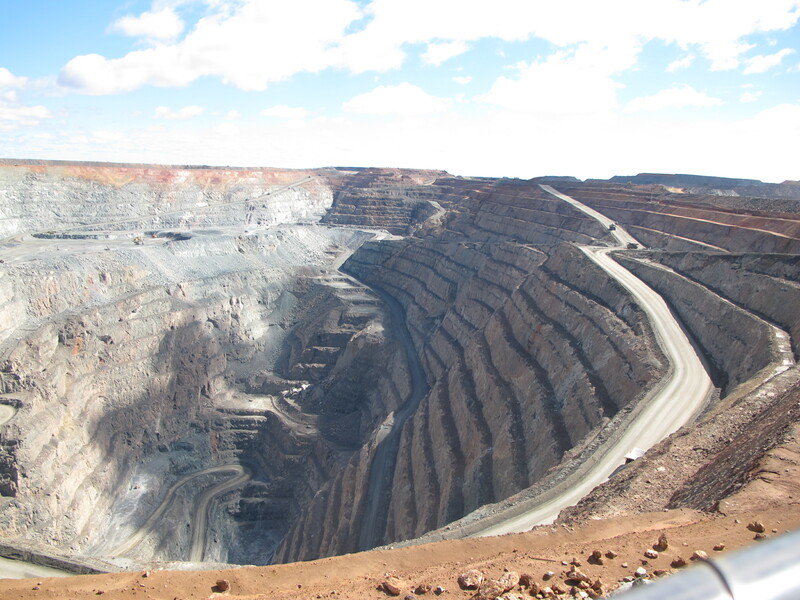 The next morning was taken up by a quick gear tune of my bike and a tour of the Super Pit mine (below) that feeds the Kalgoorlie economy. 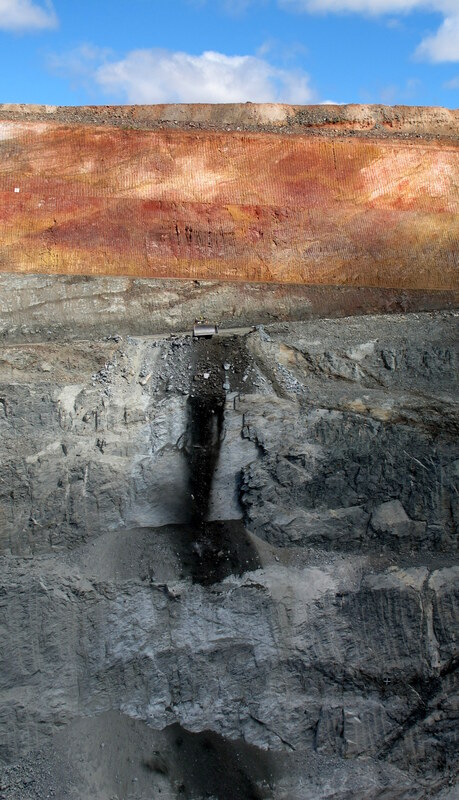 The excess rock being pushed over the side (below left) was deafening. And then back onto the bus to Norseman, thanks to some great service from Brian of Transwa. In 11 days, we’d seen rabbit fences 1 and 2, Wave Rock and Lake Ballard so whatever else the trip might bring, we’d bagged most of the big stuff. We were both ready to hit the bitumen again and head east. 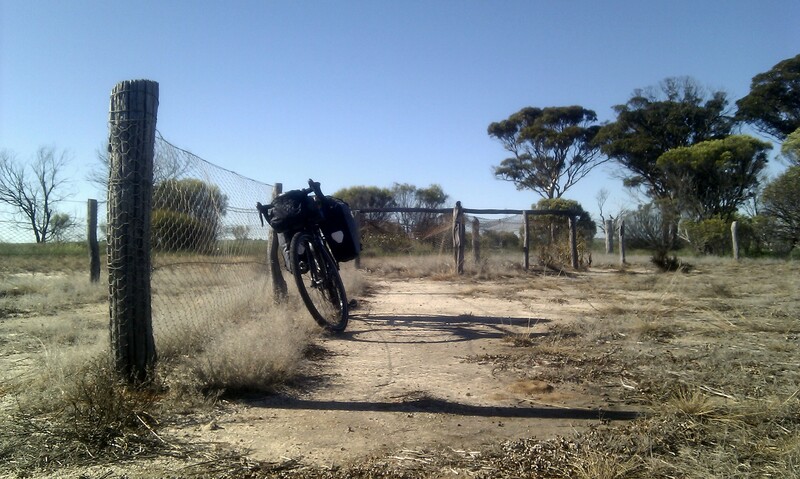 This entry was posted in Bike touring, cycle touring and tagged bike touring, Nullarbor by quaddess. Bookmark the permalink.